The S by Ticwatch is a multitasking machine that’s part personal assistant, part fitness coach. This model’s functionality will quickly have you relying on it for your fitness needs and much more. This watches’ versatility is what makes it one of the leading models in the Ticwatch line, of course, the reasonable price is also responsible for the popularity of the S. Affordable, easy to use, and loaded with a wide range of features that allow you to customize your fitness tracking experience, you can’t go wrong if you’re looking for a dependable fitness tracker you can use to meet your weight loss goals. Our Verdict: Reasonably priced, versatile, compatible with Android devices, this model allows you to easily set fitness goals, set reminders for events, respond to texts, and so much more. We would recommend this model to anyone in need of a tracker that allows you to do more than just track your fitness goals and progress. 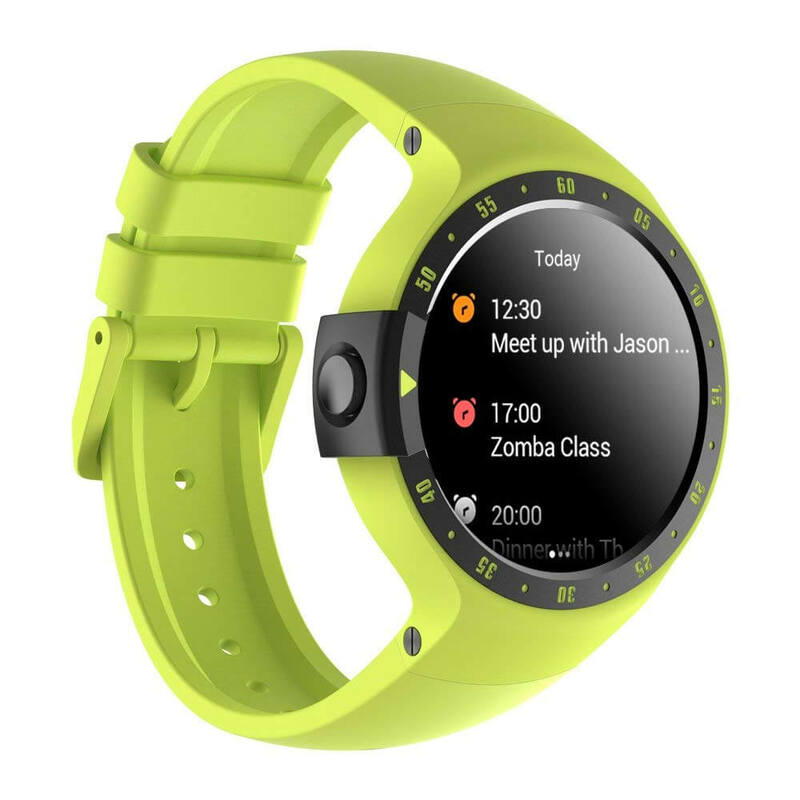 The Ticwatch S is a model that operates on the Android Wear 2.0 operating system, which makes it compatible with a wide range of Google apps. There are dedicated fitness trackers, and models that specialize in fitness tracking features but also allow you to answer calls and texts, set reminders, stream music and monitor caloric intake. This is the latter of the two. It’s a true workhorse that’s like a personal assistant for your wrist. Aside from sending notifications for appointments, messages, and phone calls, this model features multi-language support, can offer clean eating lunch ideas, provides sleep monitoring features, music detection, and more. This model’s versatility will allow you to customize features, download apps, set fitness goals and track progress. Easy to use and equipped with a simple user interface, this is the fitness tracker you need if you want to make serious lifestyle changes and need a virtual cheerleader that can help make that happen. This model is compatible with a wide range of third-party apps. Use the Google Fit app or download other apps in the Google Play store to stay on track with your fitness goals, meetings at work, upcoming appointments and more. Use Google Fit and download fitness apps based on preferred exercises and activities. Google Fit will help keep track of your activity level and fitness by tracking your strength training sessions, heart rate, runs, walks, jogs, and more. This feature not only provides coaching but it also closely monitors your heart rate, ensuring your heart rate is in the zone. The personal assistant features will help you stay track at work or at home. The Google Assistant will send notifications and reminders. Search Google for answers to any questions, respond to texts, get reminders for your next doctor’s appointment or a meeting at work. Say “OK Google” to activate, or press the power button to trigger the personal assistant feature. This model is covered by a one-year warranty and comes with a thirty-day money-back guarantee. As your personal fitness coach, stay on top of your fitness goals, keep track of calories burned, steps taken, monitor your heart rate, manage your workouts for the week, track caloric intake, and more. This isn’t a feature you’ll commonly find on lower priced models. So, we were pleasantly surprised to learn the S features GPS functionality for route planning and more. Use GPS to plot out the course for your next walk or run. The ability to do so will also allow the fitness tracker to more accurately measure calories burned, steps taken, and overall progress. If you hate bringing your smartphone with you when you go to the gym or go for a run, with the S, you don’t have to. This tracker allows you to take your favorite music with you, no smartphone needed. To do, first, sync your stored music with your fitness tracker’s music library. Use the built-in speakers or connect to a Bluetooth compatible headset and enjoy your motivating workout playlist as you burn calories. The large, vivid display screen consists of a 1.4 inch OLED display with a clean user interface that allows you to quickly switch features or go from one menu to the next. You can easily read the display screen, even in bright sunlight. Wear your fitness tracker during sleep and allow the watch to monitor how active you are, in order to determine the quality of sleep. if you toss and turn frequently during the night, this can majorly impact the quality of your sleep and may explain why you feel so exhausted in the morning. This model comes with a 300 mAh battery that offers the same battery life as the competing Apple Watch Series 2 fitness tracker, at eighteen hours per charge. However, this can heavily depend on if you use the GPS or sleep monitoring features. If you don’t use GPS this watch can go two to three days without a charge. To learn more about how this Ticwatch fitness tracker stands up to the competition, click here to view our buyer’s guide, where you’ll also get an in-depth look at the five leading models of fitness trackers on the market. Water resistance isn’t the same thing as waterproof. A fitness tracker that’s waterproof can be worn when you shower, go for a swim or participate in another type of water-related activity. While the watch isn’t waterproof, it is water resistant and can handle light rain or splashes, but should never be fully submerged. This fitness tracking machine by Ticwatch, the S is a leading model for a reason. Efficient, versatile, easy to use and compatible with a wide range of third-party apps, this highly customizable watch is a fitness coach, cheerleader, and personal assistant in one and a watch you won’t want to leave home without. We gave this model a rating of five out of five stars.